Man that place is bad luck. 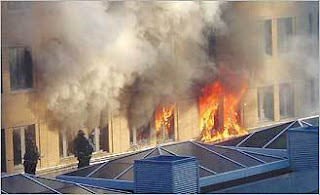 If you haven't heard or seen, the Mandarin Oriental was a tad bit on fire earlier this morning: four-alarm fire that is. Fire department spokesman Steve MacDonald said the blaze broke out at 7:43 a.m. on the fourth floor of the 14-story structure at 776 Boylston St. Firefighters arriving found heavy smoke and fire in three rooms containing construction materials, said Deputy Fire Chief Richard DiBenedetto. I remember reading about 6 months ago about how the person that bought the penthouse unit sued the developer to get out of buying it. Then more recently, I read that many of the owners that had purchased pre-construction are now trying to sell their units. If you've walked past the building recently, it doesnt' really look as impressive to me as I thought it would be. I'm sure lots of other folks feel the same way, seeing as how they're all selling. Besides, $2k per square foot? Gimme a break. Click (here) for the rest of the Globe article. I'm reading my papers backwards, so right now I'm reading the Sunday paper and the front page of the real estate section talks about how the Mandarin Oriental is also going to feature rental apartments - ranging from $6K a month for a one bedroom up to $12,500 a month for a 2 bedroom. The real estate agents the Globe interviewed said they didn't foresee any problems renting units out at that price. I disagree, but I guess time will tell. John Keith has a couple of posts on the Mandarin Oriental as well. Click (here) to see the MLS listings for the re-sale units at the Mandarin. Click (here) for an updated article on the extent of the fire damage and a possible delay in the grand opening that was originally scheduled for July. 1 Response to "Mandarin Oriental On Fire"
I don't even want to think of the condo fees.